Dr. Jerris Hedges, MD, has been named the acting director of the University of Hawai’i Cancer Center. Dr. Hedges is the dean of the John A. Burns School of Medicine at the University of Hawai`i, and he took the helm at the Cancer Center on Nov. 21, after Dr. Michele Carbone, MD, PhD, resigned the director’s post to return to cancer research. 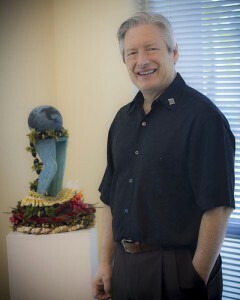 Dean Jerris Hedges, MD, in his office at the UH medical school. Dr. Hedges became dean of the medical school in 2008, moving to the University of Hawai’i from the Oregon Health & Sciences University (OHSU). He is trained as an emergency physician, and has spent the last three decades contributing to the medical field through his work in clinical care, university teaching, research and administration. In Hawai`i, he is also recognized as a leader who has strengthened the medical school by building vital bridges with the school’s community partners and collaborators. In 2013, he was named “Physician of the Year” by the Hawai`i Medical Association. At OHSU, Dr. Hedges served as Professor and Department Chair in Emergency Medicine and was named Vice Dean in 2005. Dr. Hedges has also served as President of both the Society for Academic Emergency Medicine and the Association of Academic Chairs of Emergency Medicine. He is a member of the National Academy of Sciences’ Institute of Medicine, which advises the nation on health policy. Dr. Hedges earned his bachelor’s degree in aeronautics and astronautics, his master’s degree in chemical engineering, and his medical degree at the University of Washington. He completed his residency at the Medical College of Pennsylvania and served on the faculty of the University of Cincinnati School of Medicine before joining OHSU. Dr. Hedges also holds a Master of Medical Management from the Marshall School of Business at the University of Southern California. 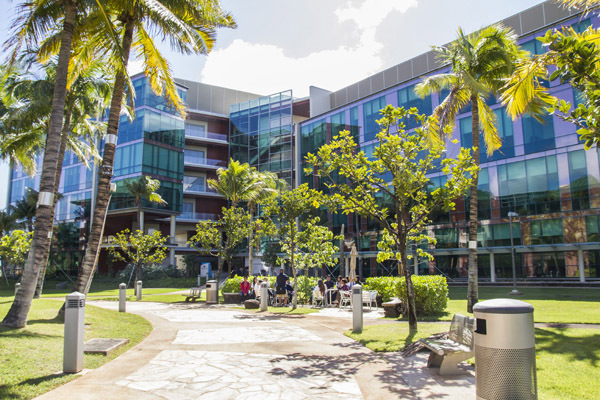 The UH Cancer Center is one of 68 research institutions designated by the National Cancer Institute. Affiliated with the University of Hawai`i at Mānoa, the Center is dedicated to eliminating cancer through research, education, and improved patient care with emphasis on the unique ethnic, cultural and environmental characteristics of the Pacific.